Generating Sales Leads Has Never Been EZ-ier! EZnet Notify Voice Reminder and Broadcasting Service is the answer to providing economic services that allows you to customize and deliver your voice notification message to your audience, with immediate delivery, or you can send it out at a future time and date. 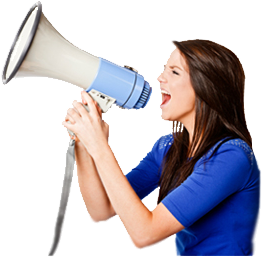 We can broadcast your message to thousands of potential customers in a matter of hours and for only pennies per call. To put it in perspective, our voice broadcasting service is 34% less than the cost of a postage stamp and the response is immediate. Our voice messaging system will allow you to customize your message and play different messages to voice mail systems and to live callers. Notifications may be designed to solicit a response from your caller and will allow the transfer of a hot prospect directly to your sales personnel, from anywhere in the world. Many of our clients have used this program to introduce new products and services, . You can upload your phone numbers, record your message, and schedule the time the call is to be made. If you have ever worked with Interactive Voice Response Systems (IVR) you probably know how complicated these systems can become. Our system is built with the User in mind, it is powerful yet simple to use. In 4 easy steps you can create custom broadcasting campaigns that will reach a wide range of clientele.